The module Monitor & Display could not be loaded. I would like to say i got this bug too. I faced the same situation during first boot after kubuntu hardy alpha 3(i386) install(screenshot attahced). When I tried to load it in 'Administrator mode' the result was same. My system is AMD Athlon 3000+ 64-bit, NVidia 6100GeForce on board VGA, Motherboard - ASUS K8N-VM. The problem is that I can not set appropriate resolution for more testing. I was expecting "Restricted driver helper" to pop up and install drivers for me but that did not happen at all. I'll keep on testing for more bugs. I can confirm this bug. I attached a screenshot as well. Kubuntu Hardy Alpha 4, running as live session - the same bug here. the problem is in displayconfigwidgets.py line 46 (and next) that object screen passed to the function is null. self.xsetup.getPrimaryScreen() returns null and then assign null to self.current_screen and then pass to the function said above and then produce error. Problem is still present with Kubuntu Hardy Alpha 5 (i386, liveCD). Installing python-dev as suggested in a related thread did not help. Installing python-dev with e.g. "sudo aptitude install python2.5-dev" only fixes the kcmshell/python problem in user management. It doesn't fix the monitor&display problem. Looks like the root cause is the integration of the new 1.4.0 X server. This server does no longer require a ServerLayout section in xorg.conf - see that attached xorg.conf for the Alpha 5 live CD. When starting displayconfig, the code calls /var/lib/python-support/python2.5/displayconfigabstraction.py which still tries to read the ServerLayout section of xorg.conf (line 124), but does not succeed and exits with a failure. This causes the uninitialized screen variables in the calling functions. Seems like the concept of deducing the X server properties from xorg.conf is hopelessly broken with a mostly self-configuring X server as 1.4.0 (future servers will not even require an xorg.conf at all). There needs to be a smarter way to retrieve the current X server configuration. A quick-and-dirty approach may be to retrieve the information from Xorg.0.log. Seems like a _huge_ rework of that module is required anyway. Looks like the smart way would be to use XRandR (http://www.x.org/wiki/Projects/XRandR) as the preferred way to set screen size, orientation and/or reflection of the outputs for a screen for modern X servers. Maybe some URandR (http://www.x.org/wiki/Projects/XRandR) or Python-XRandR (https://code.launchpad.net/python-xrandr) python code can be re-used? Now i can open displayconfig alright, but its pretty empty inside, i dont think ubuntu/xorg has detected my hardware correctly. I had the same problem too...kubuntu hardy fresh installed. I have a laptop, dell xps M1530, nvidia geforce M 8600 GT, i have used the restricted drivers and it works, but cannot change resolutions, and so on..
all the latest Hardy packages. > I had the same problem too...kubuntu hardy fresh installed. 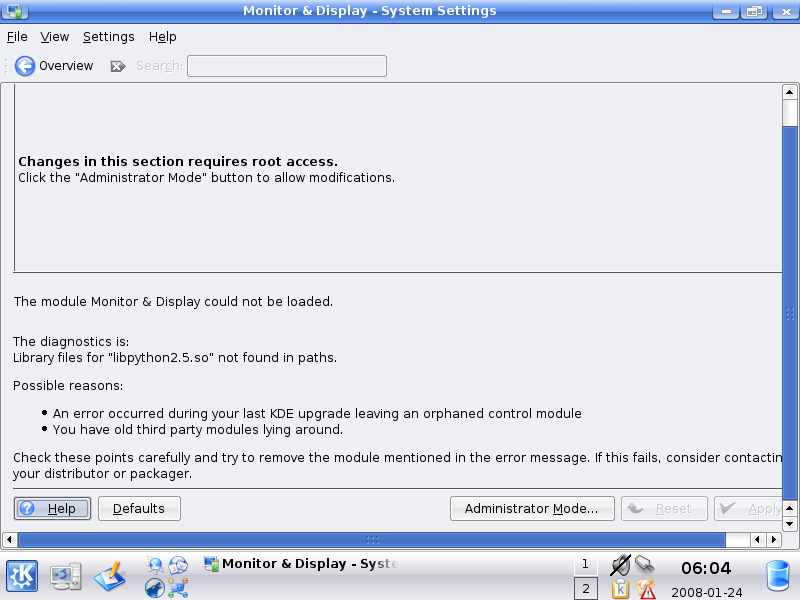 > restricted drivers and it works, but cannot change resolutions, and so on..
> The module Monitor & Display could not be loaded. > all the latest Hardy packages. those are in fact the same conclusion as Harald Seipp. The whole module is broken as the X settings has changed. Reading from the conf file fails and it certainly can't write a new-flavour conf file as well. The first Kubuntu Hardy KDE4 Alpha (https://wiki.kubuntu.org/HardyHeron/Alpha5/KubuntuKDE4) comes with a completely new displayconfig module that indeed uses XRandR. It is not fully operational yet (settings cannot be changed), but this looks like the right approach. Hopefully someone will backport that to the stable Kubuntu stream (if not already done). http://bryceharrington.org/drupal/display-config-1 describes the recent progress of the Ubuntu display configuration. It's a problem with the xorg.conf (apparantly some items were removed which Monitor&Display module still looks at), so anyone who by default replaces it by his own probably won't get the error. For first time users this would be pretty annoying. I ran "kdesudo displayconfig" from a konsole and I get the exact error message as in the original posters (I'm running hardy alpha6). After fiddling a bit it seems that as pointed out above adding the "ServerLayout" section does the trick. Add it to xorg.conf and it opens again (it won't close anymore but I'll raise another bug for that). guys read comment "Harald Seipp wrote on 2008-02-23" that explains what is the *real* problem. readding "ServerLayout" is not a fix, just a workaround, but this module need to be rewritten as xorg.conf is changing. Right, but we're close to release. A rewrite isn't happening for Hardy. Fixups are really all we can do. anyway better a workaround than nothing, but a question: Ubuntu how they do? If a re-write for Hardy is no option and the module is broken by design, what can we do? While a) would be the conservative approach - "don't expose what's broken", b) and c) would be the more adventureous approaches where b) opens the perspective to get common codestreams for KDE and KDE4. Anyone with a better idea? For now I would prefer Scott's idea on the development list, option "d)": use the workaround for 8.4/KDE3. It would be sufficient for beginning users, while more advanced users can install whatever they like. don't know yet if it will help or if it does how much. - only 640x480 and 800x600 resolution. - Gamma correction doesn't work... it also didn't work before the changes and I will open a new bug tracker for it. This should be ready to upload shortly. Work around for the resolution issue is to go into the Hardware tab and configure your monitor to use a generic LCD/monitor with the desired resolution. Would you please try that. Please attach a copy of /etc/X11/xorg.conf to the bug.
" ... Boolean options may optionally have a value specified. When no value is specified, the option’s value is TRUE." 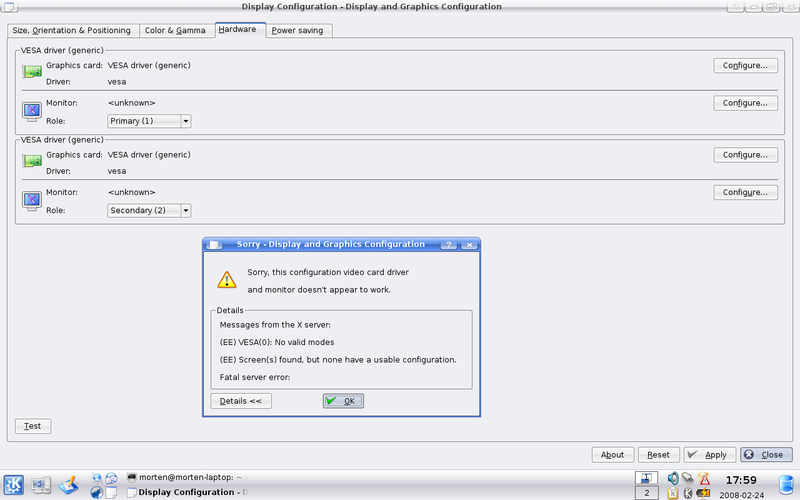 Looks like displayconfig does not obey this convention. Hope this helps in fixing the error / resolving the problem for others.